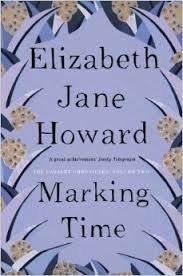 Marking Time is the second in the series of The Cazalet Chronicles. The book begins at the outbreak of war in 1939, and life has changed for the Cazalets. Howard tells the stories of the humdrum of life as a consequence of war. The heady days of ‘the light years’ are behind them, as the war brings on the evacuation of the family to Sussex, and the restrictions due to rationing of food, fuel and of opportunity. Howard captures the initial fear of war, which then gives way to a boredom – particularly experienced by the adolescence girls. Their gender means that they are not sent away to school (although the boys hate it), and they are bored by the routines of life. They are marking time to become adults, yearning for freedom of choice. The narrators in Marking Time are largely, Louise, Polly and Clary. As a result, the book is less sprawling than The Light Years, as the focus on fewer characters lends itself to greater depth. There is also a more definitive narrative arc, as the events of the war, and of life stages happening to some of the characters – Louise, Clary, Zoe, Polly.. The outbreak of war gives rise to different perspectives for the men in the series. Hugh, injured in the First World War must sit out service. Edward goes into service, but comes out to help the family timber business. Rupert, the youngest, joins up but goes missing in action as Zoe gives birth to their daughter. Howard’s exploration of this loss through the eyes of Clary, his daughter, is very moving, as she clings to the idea that he must be still alive. In her exchanges with her step-mother (Zoe), she seems to have the greater maturity, as Zoe disappears into the small world of her first born child. Howard makes her characters suffer, and life is not straightforward for Polly, whose mother is gravely ill. Again, Howard’s observations of a couple, Sybil and Hugh, not communicating well with each other, or with Polly, is so poignant, and is mirrored in the friendship between Polly and Clary, who declare that they must always be open with each other. The theme of the feminist agenda, and what it was like for the women in the era, continues from the stoic Duchy, her sisters, the dutiful Villy and Rachel, and even with the rather destitute Miss Milliment (the governess). There is also the running theme of ‘marking time,’ of growing up, of loss and of love. I enjoyed Marking Time more than The Light Years. It was more involved and more gritty. I was in a rush against fading light to finish Marking Time on a long car journey, and when I did, I didn’t much want to say anything to anyone. If Confusion is anything like this one, I’m in for a treat.